Like we never have enough white shirts in the closet. I never have enough white cardigans. The basics of my wardrobe is light colors, I use the little black (most of the time to combine with another color) so I need a jacket in bright colors for when the weather cools. When I go to fabric shop and find white jersey fabric, I´m very happy! This time I decided I could give it an original touch to my cardigan, something that differs from what we find in the shops and the idea of a small crochet lace was the perfect solution. Having made the cardigan, I sewed the lace crochet around the edge and sleeves, then I went through with the overlock, being careful that the blade does not cut all the lace. And I ended up covering all with a small elastic bias, with the intention that the crochet lace stay on the side on the fabric and not forward. Long time I was trying to decide whether to put some kind of closure, buttons and buttonholes were discarded because the socket does not. At the end I thought the original way to close the cardigan is using one of the sweater guard clips that I bought recently on Etsy. Today is Halloween in North America. Here, in Spain , we celebrate this holiday otherwise different.. The morning is reserved to bring flowers and visit the graves of loved ones and it´s tradition to eat roasted chestnuts and roasted corn on the cob (which is annunciation of cooler weather). You can find these delicacies stalls throughout the island. Of course, in the night we go on party dressed as vampires and monsters..
Am I the only one who did not talk about Mad Men??? Now we are seeing the beginning of the fourth season of Mad Men in Spain. I´m doing a compilation of beautiful dresses that can be seen in the series and this beautiful dress with its cardigan will probably be one that I sew for me, but that´s another post... My God!!! Is not it wonderfull???? that I will wear a lot this next winter. After weeks of work, I decided that Sunday was a day of FUN. So, I wore the top of my Violet Outfit that I made time ago and a skirt and jacket outtit that takes me fifteen years with me. 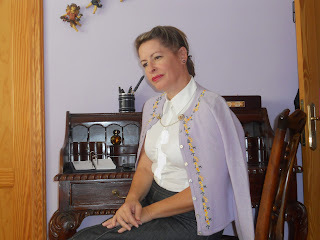 To complete 50s style, I used the Lavender Dreams hat I finished recently and purple shoes too. Certainly, Internet and people who are here have aroused in me and I love vintage sewista change. I always liked this style, but people around me usually limits me and alway ended up wearing jeans to be like the rest. When I discovered the bloggers and noticed that there are people who like same what I and what don´t matter if others look with disapproval... I thought I was a little less crazy... Anyone else same thing happened?? Today, a loooot of pictures and few words. This is Miss Adri the night before the event. And Miss Yaz whit her elegant dress. My oldest son, he was making the gun for three weekends. There was a costume contest and guess....... They won !!!!! 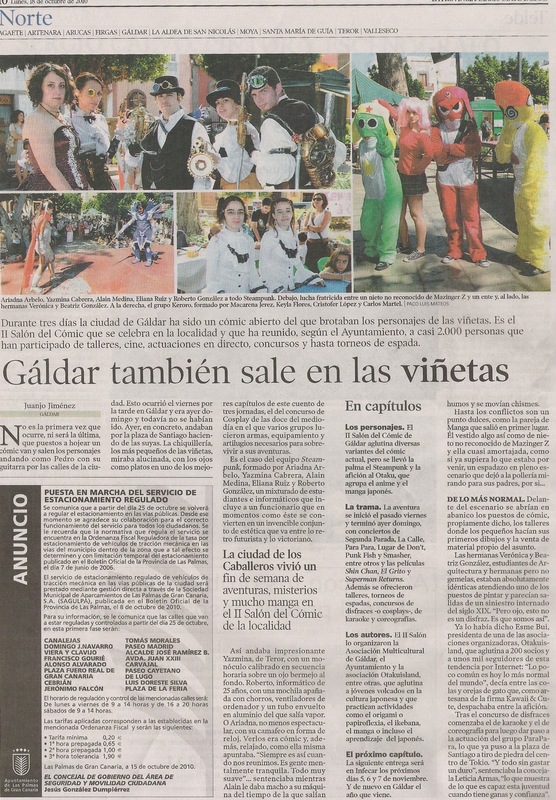 And the next day, we had a little surprise..... A small interview in the newspaper. A weekend very, very fun.
. I wanted to give something more than decoration to Miss Adri´s corset, so I thought that some pleats on the front center would be interesting. After sewing and ironing the pleats, I added these to the center part of the corset, still hold the bones in the seams of the corset so that it becomes rigid. Here, some pictures of the skirt and corset finished. The skirt has a longer backpiece, I sewed a piece of stiff tulle below to get a crinoline effect. Of course, I made two crinolines, one for each skirt and every crinoline has three layers of ruffles, underneath all this I made some minibloomers, but I forgot to take photos of they. When I finished with the girls started with the costumes for boys, this is a waistcoat I made for my son. The front has fabric below and leatherette over, my son asked me a pocket for the camera in a safe place. This is the aspect of the waistcoat after finished, with a piece of patch I made also a fist to put him on the arm ornament. 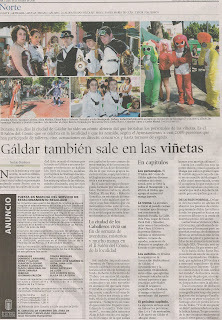 The other guy was dressed as a character in a videogame called Altair, Assassin´s Creed videogame. So I sewed several layers of cloth to an old shirt to get the character costume dresses and accesories with leatherette too. Tomorrow, I will put pictures of the event. Until then, enjoy Wednesday.